Buggers, PT,s Chrino's , and midge on a heavy rig. Still getting some very nice Trico hatches early in the morning, and the caddis are still showing.. by about 9 am, it’s over with. So get there early. WD40 a great pattern for the Tricos, along with spent wings trico and an emerging caddis, a very productive pattern for dry takes when they caddis are dancing. Damsels are coming off with this heat and a damsel nymph is a good one to have on your rig. A good idea is to get the CLEAR glow in the dark Thingamabobbers, you'll get use to keying in on it (looks like a large airbubble, to you AND THE FISH. The fish won't move off it as easily. Nymphs they weren't too picky about, ADD, ADHD, black brassies, nitro caddis, bubble back, hare's ear. Flows 90 cfs, about 50 cfs below median: TAKE TEMPS after 9 am... off at 69 degrees. 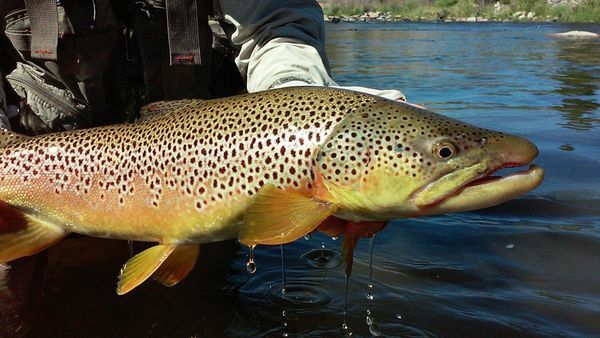 CATCH & RELEASE NO BAIT, BARBLESS (Special Regulations)Flows have been steady.